About 80 doctors from Holy Family Hospital in Okhla and some other hospitals across the city have written open letters to the Prime Minister's Office raising concerns about emissions from the Okhla waste-to-energy plant. In their letters, written on individual letterheads, doctors have said polluting emissions from the plant could lead to allergies, asthma, cancers and reproductive anomalies. Many of these doctors also live close to the waste-to-energy plant. Central Pollution Control Board checks at the plant site have revealed dioxin emissions to be way higher than the permissible limit. Residents are extremely concerned about fly ash from the plant falling on their homes and vehicles. Delhi Pollution Control Committee issued a show cause notice to the plant in January for not meeting the air quality standard. 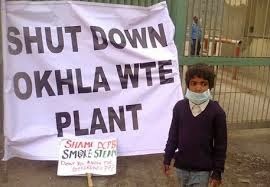 "An unusually large number of patients are coming in with respiratory ailments like asthma and bronchitis which can be attributable to the high levels of pollution in Okhla caused by the plant. The Holy Family Hospital has announced plans to launch a medical college. We would like it to function in an unpolluted environment," Fr P A George, director of the hospital, said. Neonatologist with Fortis La Femme Ashu Sawhney, who lives just behind the plant, said, "Based on my experience as a paediatrician as well as various studies, I can say such pollutants cannot just cause respiratory illnesses but also learning and behavioural problems. My daughter developed asthma last year," she said. Another paediatrician from AIIMS Shivani Randev said, "Most children from the area are suffering from respiratory illnesses. These pollutants can cause foetal anomalies, infertility, cancer and other health issues. This is a humble request from residents, especially doctors, from the area to please help us and shut down the plant." The letters will be submitted to the National Green Tribunal by petitioners who have filed a case against the plant. One of the main reasons for anxiety among residents and environmentalists is high dioxin levels around the plant. When CPCB monitored air quality there last October, dioxin level in stack 1 was 1.06ng TEQ/Nm3 (toxicity equivalent) and that in stack 2 was 0.93ng TEQ/Nm3 though safe level is 0.1ng TEQ/Nm3 only. Not just pollution, environmentalists are also concerned about the social cost of this technology as a large number of ragpickers stand to lose their jobs if waste-to-energy plants are widely adopted for waste management. Though they are common in the West, there is a raging debate even there about the suitability of waste-to-energy plants. In Delhi, the issue is even more relevant because there is no waste segregation at source which is why chances of non-biodegradable waste like plastics ending up in the incinerator is high.